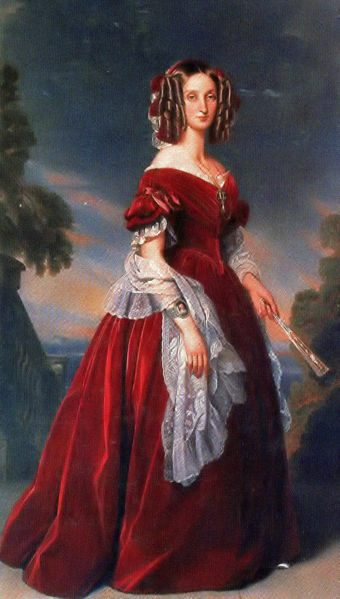 She adored her father, the controversial Louis-Philippe, Duc d’Orléans (later “King of the French”) but was even closer to her mother, the universally revered Marie-Amélie of Naples. She inherited much of her mother’s piety and charity, along with a certain amount of her father’s political liberalism. She was very tender-hearted, abhorring bloodshed and capital punishment, even in the case of would-be assassins who had attempted her beloved father’s life. When Leopold teased her about leaving her as Regent of Belgium while he was abroad, she insisted she would never sign anyone’s death warrant. (A striking contrast with her grandfather, the French revolutionary, Philippe Egalité, who was infamous for voting for the death of his cousin, King Louis XVI! ).